KUALA LUMPUR: The much-debated Constitution Bill (Amendment 2019) did not get the green light in Parliament last night, an outcome that was envisioned by Gabungan Parti Sarawak (GPS). Speaker Datuk Mohamad Ariff Md Yusoff announced that 138 MPs voted for the amendment Bill to Article 1 (2) of the Federal Constitution while none voted against it and 59 members of the House did not cast their votes. Given the significance of the amendment Bill, a two-thirds majority or 148 votes were required for the Bill to be passed. Hence, the Bill was rejected. The amendment was said to reinstate the original spirit of the Constitution and Malaysia Agreement 1963 (MA63), with an aim of elevating the status of Sabah and Sarawak as equal partners in the Federation of Malaysia. 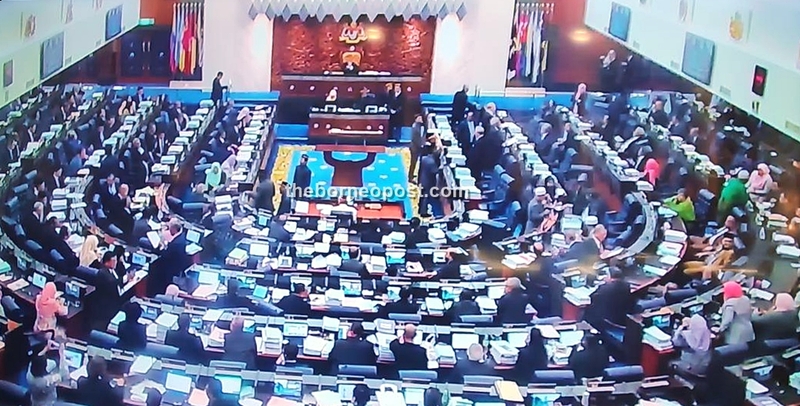 Prior to the voting process that began after 10.15pm, Datuk Seri Wan Junaidi Tuanku Jaafar (GPS-Santubong) tabled a motion under Standing Order 54(2) to have the amendment Bill referred to a Special Parliamentary Committee for further review. His motion, which was seconded by Datuk Seri Tiong King Sing, received only 60 favourable votes against 176 objecting votes and hence, Ariff announced that it be rejected. The amendment Bill was fiercely debated for hours in Parliament following its second reading by Prime Minister Tun Dr Mahathir Mohamad at 2.30pm. Among the MPs from Sarawak who took part in the debate on the Bill were Datuk Seri Fadillah Yusof (Petra Jaya), Datuk Seri Wan Junaidi Tuanku Jaafar (Santubong), Dato Sri Nancy Shukri (Batang Sadong), Datuk Seri Rohani Abdul Karim (Batang Lupar), Datuk Wilson Ugak Kumbong (Hulu Rajang), Mordi Bimol (Mas Gading), Ali Biju (Saratok), Anyie Ngau (Baram), Dr Kelvin Yii (Bandar Kuching), Hasbi Habibollah (Limbang), Rubiah Wang (Kota Samarahan), Aaron Ago Dagang (Kanowit) and Ahmad Johnie Zawawi (Igan). Dr Mahathir, who is national Pakatan Harapan (PH) chairman, was seen making his way to the Parliament Chamber at around 9.15pm albeit Ariff earlier announcing that the ministerial winding up could be expected at 8.30pm. In the winding up speech, Dr Mahathir said a Special Committee was not required for further review on this Bill since the amendment was clear. He added that the negotiations and discussions between the federal government and Sabah and Sarawak state governments would carry on in line with the spirit of MA63.